Sri Venkatanatha (Vedanta Desika) (1268-1369 A.D.) was a great post-Ramanuja writers of the Visistadvaita School of thought. He was a polymath with more than one hundred works to his credit, covering several branches of learning like Nyaya, Mimamsa, Vedanta and Sahitya. His Yadavabhyudaya was commented upon by the great Advaitin Sri Appaya Diksita who paid beautiful encomia to the poetic genius of Desika. 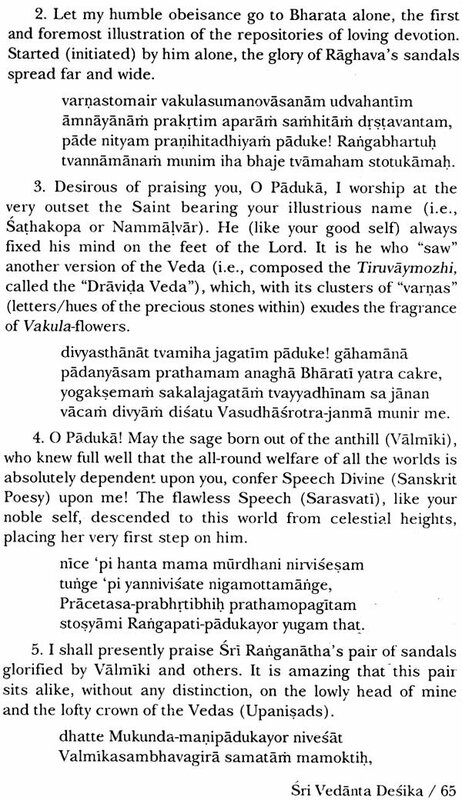 Desika wrote in Sanskrit, in Manipravala (Sanskritized Tamil), Prakrit and pure Tamil. He reinforced Sri Ramanuja's philosophy and strode like a colossus among contemporary scholars and was an uncompromising critic of the rival schools of thought. Desika was an embodiment of humility and simplicity, detachment from worldly enjoyments and unalloyed devotion to the Divine couple, Sriman-Narayana. A great exponent of the Dravida Veda (Divyaprabandha of the Azhvars) as also the Sanskrit Vedanta, Desika was also responsible for the establishment of two important Srivaisnava Mathas-Sri Ahobila Matha and Sri Parakala Matha. He resolved the processional deity of Srirangam after the threat receded. The world of scholars remembers him with gratitude for the role he played in saving the sole manuscript of Sudarsana Suri's commentary Srutaprakasika on the Sribhasya of Sri Ramanuja, during the sack of Srirangam. Dr. M. Narasimhachary (b. 1939), writer of the present monograph, is an erudite scholar of Vedanta with specialization in Visistadvaita. Fonder Professor of the Deptt. of Vaishnavism, University of Madras, he took his Ph.D. on his thesis "Contribution of Sri Yamunacarya to Visistadvaita". He taught Sanskrit and Indian Philosophy at Kuala Lumpur (1982-84). Visiting Professor in USA and Visiting Academic at the Oxford University, UK, Dr. Chary has authored about 80 research articles and 30 books. Recipient of titles such as Asukavisekhara, Sastrakavirat, Srivaisnava Ratna and Desika Bhavajna, he translated into English several works of Vedanta Desika. Currently he is the Editor-in-Chief of the English religious monthly, Nrisimhapriya, Published by Sri Ahobila Matha. This monograph tries to present the multi-faceted achievements of Vedanta Desika in a comprehensive manner. It is seen in the history of several nations of the world that God, from time to time, chooses men and women of character, to spread the message of divine love and spirituality among masses. These people set a glowing example to others by their personal life and work. By their perfect wisdom and spotless character, they create history. Their lives are with a set purpose. The course of their activities is already chartered and hence we do not find anything contradictory or incongruous in their lives. Sri Venkatanatha (more popularly known as Vedanta Desika) (1268-1369 A.D.) was such a great Srivaisnava teacher born in the post-Ramanuja period. His sole aim was to fortify the Vedanta system as explained by Sri Ramanuja against the attacks of the rival schools of thought and to offer a cogent exposition of that system. He enriched the Srivaisnava system by his monumental contributions covering different aspects of religion and philosophy, theology and literature. He was an extraordinary person who combined in himself the qualities of head and heart. A polymath with more than a hundred outstanding works to his credit, he strode the field of contemporary religious and sastraic scholarship like a colossus. He wrote in Sanskrit,• pure Tamil, the mixed Manipravala (Sanskritized Tamil) and Prakrt, His works may be classified as devotional lyrics, literary works, works on sastras, theological works and Tamil poems. They are a class by themselves. Venkatanatha had none to excel him either in debates covering abstruse sciences like Nyaya and Mimamsa, Sankhya and Yoga, or in the art of composing beautiful poetry of lilting cadences depicting the sentiments charged with the Power of Suggestion (Dhvani). Scholarship sat lightly on his shoulders. "Wise men, on the basis of many convincing proofs, consider me to be an incarnation of the Bell of Lord Hari. This bell frightens away the Raksasas, the enemies of celestials during battles, and it is used by the lotus-seated Brahma during his worship (of Lord Hari)."! One may also notice that there is no bell in the temple of Lord Venkatesvara in the hill-shrine at Tirumala, which is normally hung from the ceiling and which the devotees ring as they enter the temple for worship. In his Adhikaranasaravali, Desika (verse 561) refers to himself as the Pancajanya conch blown by Lord Ranganatha Himself. The conch which resembles the Veda by its configuration as well as sound, drives away the demoniac forces (rival debaters). 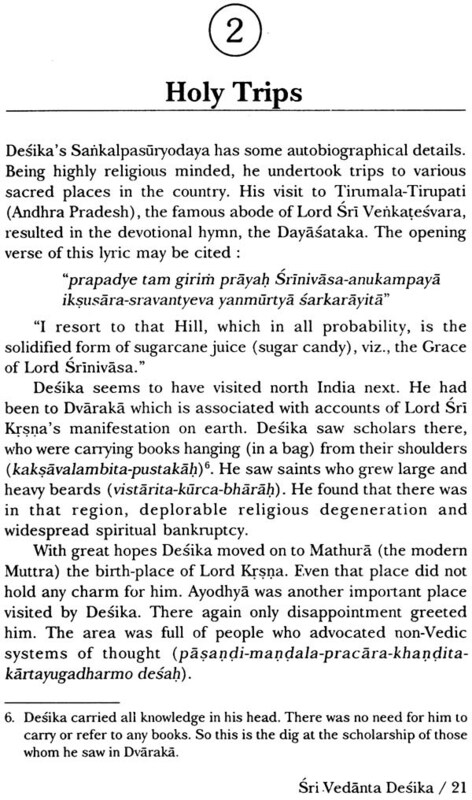 This reaffirms the popular view that Desika was an incarnation of the Bell of the Lord. There is no difference between-the Bell and the Conch in so far as producing frightening sound that could drive away the enemies is concerned. 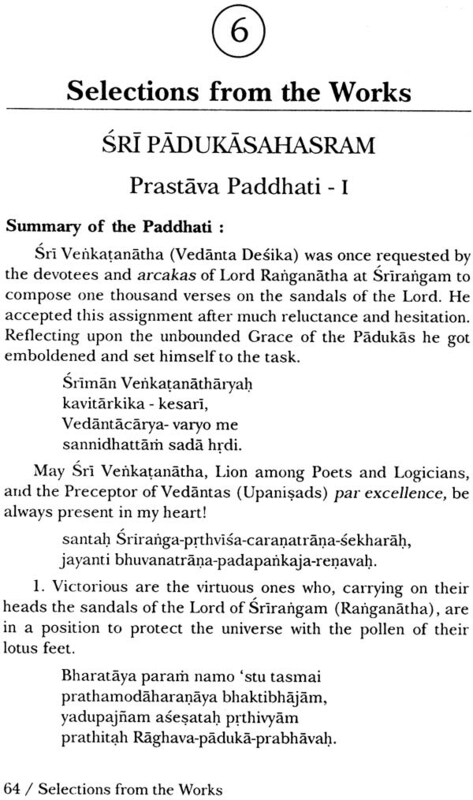 Venkatanatha was conferred the title Vedanta Desika (with synonyms like Vedantacarya, Nigarnanta Desika, Nigamanta Mahadesika, etc.) by Lord Ranganatha Himself." 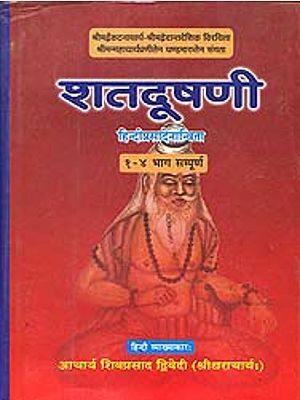 This title means "A great preceptor of the Vedantas (Upanisads)". We shall hereafter refer to him by the shorter name, Desika, He had in addition, other significant titles like "Sarvatantra- svatantra" (one who could refute the existing lore of different schools of thought and rewrite it independently), and "Kavitarkika Simha" (Lion towards Poets and Logicians) and other synonymous titles like "Kavikathaka-ghata-kesari", and "Kavikathaka Simha".